After requesting your appointment, and once the hour is mutually agreed on a “Scheduling Confirmation” email will be sent to you. To Prep for our session , please read and print for your appt. Email the sides and full breakdown to carynwest@mac.com to study. Bring the complete CHARACTER BREAKDOWN (with all other characters listed and a storyline) As a Rule, ask your agents to send the all project info, not just your part’s description! Read the whole script if provided. IMDB research the writers & director so we know what is style/genre of their past work. Watch the show or trailer on the Network website, Youtube, iTunes or Hulu.com to get its world and tone. IF WE ARE PUTTING YOU ON TAPE: Look over the CAMERA TAPING PAGE & find out from your Reps asap what encoded video specs they want and how we are delivering the takes. Ways to Pay, Map and Parking tips below. See you soon! No Payments + No Interest on purchases over $99 if paid in full in 6 months.) Card Usage, Cancellation and Reschedule Policies: If you wish to cancel: Up to 7 days before you use the card, we will refund all. No refund occurs after that. No transfers. No make-ups or credit to classes with this purchase. Bounced check fee is $30.00. We reserve the right to reschedule Caryn for professional or personal reasons. But you have unlimited time to use the card for hourly, ½ hour or multiple hour coaching in person or online. EVE.S (7pm-7am) PERMITS ONLY parking. RED RESTRICTED AREAS on this LEXINGTON AVE. block bet. Gardner & Curson! GREEN AREAS Park anywhere on Gardner or daytime on Lexington is best, Hampton or Norton Sts (bet. Curson and Gardner) one block north or south of Lexington. Fountain free after 7pm. 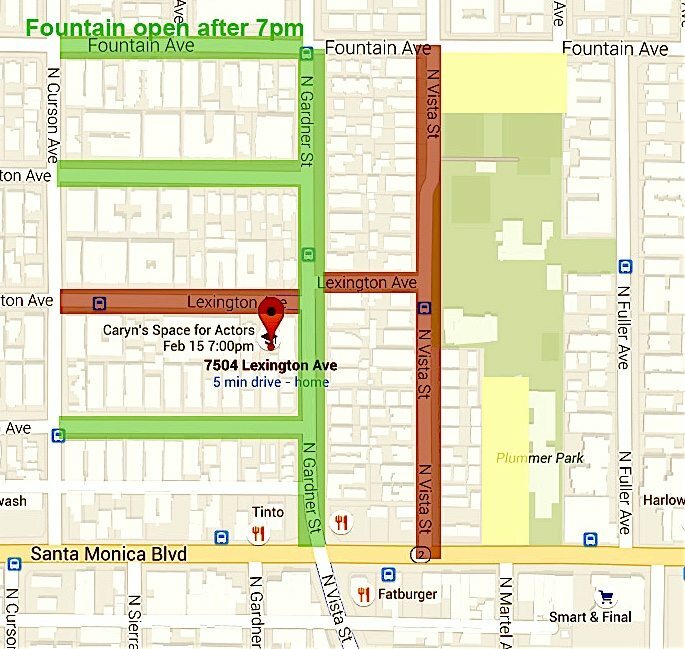 Reliable alternatives are: YELLOW AREAS Plummer Park parking lots (8am-10:15 pm Martel/Santa Monica Blvd or Vista / Fountain Ave) — and walk 2 blocks over to the studio.